The killing of an American national by members of an endangered tribe in the Andaman islands off India's east coast has renewed concerns over the surreptitious practice of "tribal tourism" in the archipelago, Omkar Khandekar writes. The indigenous islanders of North Sentinel, among the last of the "uncontacted" tribes in the world, killed 27-year-old John Allen Chau with arrows when he went to their island last week. Police said that Chau had paid 25,000 rupees ($354; £275) to six local fishermen to take him to North Sentinel. Media reports suggested he wanted to introduce the islanders to Christianity. 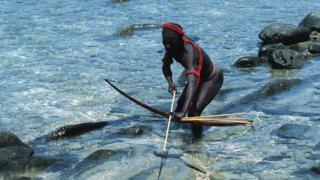 Andaman is home to five "particularly vulnerable" tribes. They are the Jarawas, North Sentinelese, Great Andamanese, Onge and Shompen. The Jarawas and the North Sentinelese haven't integrated with the mainstream population yet. This makes them a source of intrigue for many of the 500,000 tourists who visit the islands every year. Earlier this year, the Ministry of Home Affairs passed a notification exempting foreign nationals from having to acquire restricted area permits (RAP) to visit 29 islands in the archipelago. The list includes nine islands in Nicobar and two in Andaman, occupied by tribal and indigenous communities considered "particularly vulnerable". Among them was also North Sentinel island. But authorities insist tourists will still have to obtain permission from the district authority and the forest department to do so. The Jarawas live in a 1,028km forest reserve between the south and middle Andamans. To see them, many tourists take a two-hour bus ride from Andaman's capital Port Blair to Baratang which is home to limestone caves and mud volcanoes. To do so, they travel on the Andaman Trunk Road (ATR) which cuts through the Jarawa reserves. In 2013, the Supreme Court banned tourists from taking the ATR after a video shot by a journalist showed policemen forcing six Jarawa women to dance for tourists. The court reversed the decision after the state administration submitted a notification promising that no tourist or commercial establishment in the area would be permitted. "The administration has long prioritised the livelihood of the locals," says Manish Chandi from the Andaman Nicobar Environment Team, who has been studying the islands for the past 18 years. "After the court's ruling, it set up a ferry to Baratang island from Port Blair. It was a clever move. If questioned, they could always say it has made an alternative to the road available and the choice now rests on the tourists. But invariably, tourists 'choose' the road." There is no direct connection to the North Sentinel islands, which are located 50km west of the capital Port Blair. There is also frequent patrolling by the coastguard to keep intrepid travellers at bay. And yet, says Mr Chandi, people keep attempting to see the North Sentinelese - often by bribing local fishermen. "In 2013-14, a Mumbai-based businessman on a sports fishing boat was caught by the coastguard looking at the North Sentinelese," says Mr Chandi. "Often, yachts carrying foreign tourists pass by the islands. But most are deterred by the coastguard patrol and make sure they don't lurk around." Officials from the Department of Forest and Wildlife didn't respond to phone calls by the BBC. But Govind Ram, director of the Department of Tribal Welfare in the islands, indicates he is aware of the instances of tribal tourism. "It's true that people have a fascination to see the tribal community," he says. "We have made all arrangements to restrict this from happening. There's regular patrolling by the police and officials from the tribal welfare department." But given the size of the areas meant to be patrolled, he adds, "there is a chance that miscreants can enter". And despite official insistence that foreigners will still need to obtain permission from the district authority and the forest department to visit Jarawa reserves and North Sentinel, conservationists say the scrapping of restricted area permits for these islands sends a signal that they will eventually be opened for tourism. "The decision was taken unilaterally, without any consultation with local stakeholders," said Denis Giles, editor of the local newspaper Andaman Chronicles. "Instead of taking measures that might lead to tribal tourism, the government needs to continue with the 'hands off, eyes on' policy it has practised so far." Earlier this month, the National Commission for Scheduled Tribes said the relaxation needed to be "reconsidered". Despite its widespread practice and extensive documentation by groups like Survival International, which works for tribal peoples' rights, two major tour operators the BBC spoke to denied any instance of tribal tourism in the islands. "I have never had anyone inquire about tribal tourism," said M Vinod, the president of the Andaman Association of Tour Operators, which represents 102 of 176 registered tourism firms in the islands. "Police security is high and movements are strictly regulated while passing through tribal reserves." The killing of the US national, he adds, was only a case of a "security lapse". "The relaxation of RAPs is a good move for tourism," he says. And his stand on including islands like North Sentinel? "It's up to the government to decide which islands it wants to promote." Video Who are the Sentinelese tribe?